← WordPress App: Worth It? The struggling economy hit home in a new way today. As a digital mom, I fit in writing and blogging whenever I can and the public library is my favorite office away from home. While my kids are at dance, chess club, basketball practice or even on a half day when I don’t want to spend time on the road between school and home, I use the library, its quiet corners and its wireless connection to get much done. 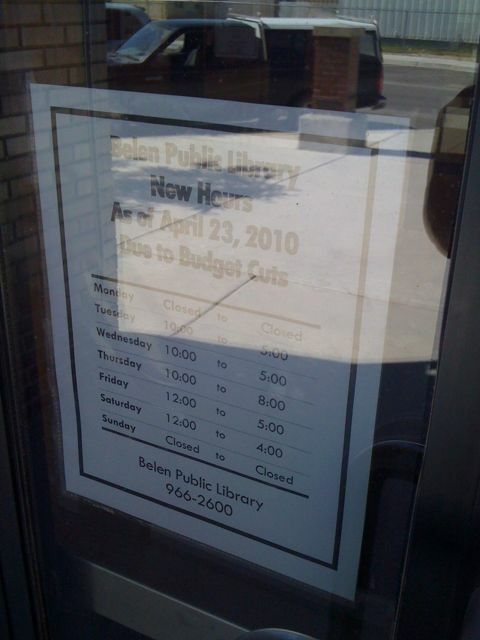 Today I showed up and learned that due to budget cuts, the library has cut it hours. It is no longer available to me at my favorite time to devote a solid hour to writing. But even more sadly, those lost hours also are no longer available to my librarian friends there who need those hours and the dollars that come with them. So now I’m sitting at a nearby McDonald’s, crowded with a bus-full of kids on a field trip. As I take them up on their offer of a $1-any-size drink and free wi-fi, I’m hoping my battery power holds out since there are no outlets here like at my friendly library. This entry was posted in digital moms, freelance writing and tagged digital mom, economy, free wi-fi, freelance writing, library, netbook, recession. Bookmark the permalink. I love my library too and I am worried the upcoming budget cuts will cut my library hours and selection etc. I want to live in a world that values libraries. The picture adds so much to this post! I sympathize. I’m a writer and a homeschooler, and I consider the library our single greatest resource. (Hmm, I may have to reconsider that. The Internet probably gets top billing.) In any case, it’s at least our SECOND greatest resource! And while I understand budgetary concerns, it seems libraries are needed now more than ever. Where else can you learn about anything absolutely free?